Prior to checking in we ask that the Guest inform us of special needs or services. (1) The Bayfront Inn provides ACCESS to a wireless internet but we do not provide the technology hardware as this would be an undue financial burden. The Brochure in the room offers the wireless code in large print and our front desk personnel will assist all guests to access the wireless system provided on the guest’s device. (2) There is no Elevator access to the 2nd floor rooms. Ours is a walk up motel built in the 1960s. (3) Our Televisions offer Closed Caption access. Front desk will assist the guest to turn this on. If you have any questions please give us a call at 805-772-5607. Our common areas are unique because they offer an inner courtyard and 2 deck viewing areas. Our rooms are motel cozy, extremely clean, and very comfortable. All rooms offer a small refrigerator, hairdryer, and a Keurig coffee maker. There is an ice machine and microwave in our Galley. 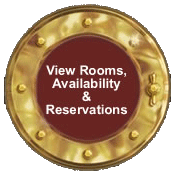 Most of our upstairs rooms offer a view of the Rock and bay. Guests have a choice of a Standard size room or a Delux size rooms. Standard rooms are approximately 11.5X11.5 square feet (not including the bathroom) with minimal furnishings and one chair in the room. Delux rooms are larger and offer a seating area. All rooms offer 1 bed type, either a King size or a Queen size bed, except for our Economy room (#18) that offers one full size bed. When you book a room online you will see a description. ALL OF OUR ROOMS ARE PET FRIENDLY. All rooms offer large flat screen tvs. WHAT YOU PAY FOR AT OTHER HOTELS we want our guest to enjoy “On the House”. Daily 2 bottles or water. A welcome treat of 2 juice packets and a small bowl snacks. Free wireless wi-fi access using the guest’s device, and HBO. We offer front desk assistance to the visual and hearing impaired to access the wireless system on the guest’s personal device. Our light and Continental Breakfast includes fresh fruit, hard boiled eggs, sausage sandwiches, bread for toasting, and various cereals plus milk. Guests rave about our morning freshly brewed coffee and we offer hot water for tea. In addition, guests receive a voucher for freshly baked cinnamon buns from our on site restaurant “to go” each morning of your stay. OCCUPANCY IS LIMITED TO 2 PERSONS INCLUSIVE OF CHILDREN OVER THE AGE OF 3 YEARS plus 1 child under the age of 3. If your travel plans change and you must cancel your reservation, we notifiy you via email 6 days prior to your arrival because you have 5 days prior to your arrival date to cancel your reservation without charge. A 15 day cancellation notice is required on multiple room bookings, whole house bookings, and for holidays and special event bookings. For private party bookings and group bookings (5 rooms +) we require a 25% non-refundable deposit to be posted 30 days prior to check-in. Group cancellation will be based on prior agreed upon terms. In the unlikely event that you must cancel in less than the prescribed cancellation notice policy time frame as indicated above, you understand that the first night’s cost of your reservation is your responsibility. If we are able to rebook your room(s), a full, or partial refund may be made. If you are booking using one of our Special package rate coupons and you cancel one or more of the days as required to receive the special package rate the cost of the room will revert to the regular price for that room for the time you have occupied. If you shorten your stay, all discounts will be reversed and reapplied per the length of stay. If you book your stay on a 2 night minimum and you shorten your stay, you will be responsible for the cost of the one night stay you are vacating unless we can re-rent the room. If you are a NO SHOW, you may be responsible for all nights of the stay. We will place an authorization on the full amount of the reservation cost 4 days prior to your arrival date. In the event the authorization is denied, we will attempt to contact you. If we cannot contact you, management will immediately cancel the reservation AND our cancellation policies will prevail. Our rates and policies are subject to change and may vary during high impact periods and special events. Our rates are very competitive and have been reduced to meet the needs of our guests. Our specials give our guests discounts far greater than AARP or AAA and no further discounts are given. We do honor discounts for Military, but only one, and up to 10%, but not on weekends. Military personnel must show their identification cards. Please review our special packages. Discounts do not apply to retail or pet fees. Discounts may NOT be combined. Management reserves the right to refuse service and accommodations to anyone. In the event of disturbance issues and guest is removed from the premises there are no refunds. 10pm TO 8am is our requested quiet time. THIS IS A NO SMOKING of any substance on any type of device FACILITY ON OR NEAR OUR PREMISES WITHIN 20 FEET. A smoking abatement fee of $200 will be assessed in the event you fail to adhere to this policy. PET FRIENDLY POLICIES: We do allow cats, birds, and dogs. We do not have a dog weight limit but we do have a 3 pet limit per room. Most of our rooms are pet friendly. Pets must be declared when you make your reservation. **You may be charged a one time cleaning fee of $30 per stay for up to 2 pets and an additional $20 for a 3rd pet. “ Dogs must be on a leash at all times when on premises and may not go to the bathroom on premises. Birds or other exotic type animals must be crated in room and on premises. Pets are not allowed to be left in a room unattended unless crated. ** Pet sitters are available. The front desk can refer you to a local pet sitter. If you book a room that is non-pet friendly and you bring a pet, you will be charged $200. ** Exemption to the pet cleaning fee is for a guest that travels with his/her 1 Service Animal. ( Service animals must accompany their owner at all times. Only 1 service animal is allowed; per ADA. If a service animal travels with another pet, the service animal is considered a Pet and then NOT considered a service animal by the ADA. If your service animal is accompanied by other “pets” in your family, our pet cleaning fee can be charged per the ADA.) In the event your animal destroys any part of the room, guest will be responsible for all repair and replacement costs as hotel determines. Please contact the front desk directly (1-805-772-5607) or toll free (1-877-772-0072) for answers to questions regarding occupancy and room amenities. Check-in: 3:00 PM. If arriving later than 6pm, please inform the office to make room entry arrangements. Our goal is to provide a wonderful experience in the desirable location of Morro Bay, CA. We strive to create an environment that is welcoming and accommodating for all individuals, including those with hearing, vision or other disabilities. We have built our site with ADA compliance in mind and have utilized available tools such as achecker.caand Google Chrome’s ADA compatibility diagnostic tools. If you have difficulty navigating our website or booking a room at our inn, we ask you to contact us via telephone or email and our helpful staff will be happy to assist you. Navigation ShortcutsOur inn’s website can be navigated by using the tab key to traverse the elements of each page and by using the enter key to activate a highlighted link. Structured, Semantic MarkupHTML heading tags are used to convey the document structure. Navigation menus are tagged as HTML maps so that the menu title can be read out, and the menu items are presented as a group. Images VisibilityAll content images include descriptive ALT attributes and all purely decorative graphics include null ALT attributes. Standards ComplianceThe site is designed to conform to Level AA compliance as specified by the Web Content Accessibility Guidelines. All pages validate as XHTML 1.0 and use structured semantic markup.